MiG: Who are you guys? Kyle Werstein: I’m Kyle Werstein and I sing and play guitar in the band. Andrew Carson plays drums and Devon Bryant plays bass. We’re a fuzzy rock band from chilly and humid Minneapolis, MN. Recently our sound was compared to “Motörhead Bubblegum”, which, depending on how you look at it, can be a pretty bitchin’ comparison. MiG: “Motörhead Bubblegum” is not a description I’ve ever heard, but it does seem to fit in an odd way. 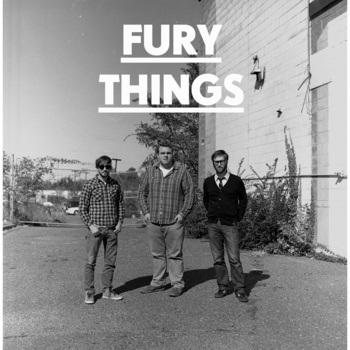 Speaking of your sound, Fury Things seems to wear its heart on its sleeve as far as influences go, and they seem to focus on 80s/90s noise rock. In fact, unless I’m mistaken even the band name is a Dinosaur Jr reference. What is it about that era that speaks to you guys? KW: Devon and Andrew are at least ten years my senior. They grew up in the era; I had to inherit it. I just turned 21. I discovered Dinosaur Jr in middle school amidst their reunion album Beyond and I seriously fell in love. It was the antithesis of everything my friends were listening to. Surrounded by Fall Out Boy, AFI and the like, me, an awkward, chubby kid had less in common with Davey Havok’s bangs than the man in the moon. J Mascis was just a guy. Black Francis was a guy. I could relate to that. There’s been a bit of a revival lately with bands like Yuck, but there’s something about the music sonically that speaks to me. It’s brutally honest. There’s no pretension. It’s just guys playing music. It’s loud. I think that’s what we strive for in our live shows. We’re loud, honest, and (hopefully) a good time live [MiG note: They are a very good time live.]. It’s less of a wanting for a bygone era (for whom my nostalgia would only be borrowed), but more about continuing the tradition of music I’ve connected with on a personal level. MiG: I certainly understand connecting with that music on a personal level. The “Our Band Could Be Your Life” bands and their brethren/descendants are far more responsible for who I am today than I should probably admit. With the age difference how did you guys hook up initially? Devon Bryant: We basically met to play music. I had been playing guitar and singing in a kind of chamber folk project, and we opened for Kyle’s old band, Lilian & The Harveys, back when they were a two-piece (guitar and drums). I thought they sounded great, and was really taken with Kyle’s guitar playing. I was pretty tipsy that night (I remember he switched to a Telecaster and I shouted “Telecasshter! !” at him from the crowd); I went up to him afterwards to say he should have me on bass in his band because “I’m jusht totally aweshome at basssh!” They were already adding two other guys to the lineup, so he demurred, but we stayed in touch, and a few months later he approached me about trying out some songs for a new project. I’d never met Andrew before that Sunday that we practiced for the first time. It kind of clicked right away. The funny thing is that I assumed Kyle was, y’know, 25 or 26 maybe, and it wasn’t until a week or two later when I suggested stopping to grab beers before practice that he told me he was only recently 20! Which means when I’d first seen him play he was only recently 19!! Kind of blew my mind, because his attitude and general sense of himself is worlds away from the cocky jackpipe I was when I was 20! Anyway, the age doesn’t ultimately matter much, and he loves the same kinds of fuzz rock music that I grew up listening to and playing in Colorado bands in the 90s, so we’re very much on the same page about our sound and our style. MiG: From what I understand, it’s not just the members of the band that are on the same page, but that Fury Things are part a larger loose group of bands that tend to play together. Who else should we be on the lookout for locally? DB: Some of our favorite bands in the Twin Cities would be Prissy Clerks, Gloss, Teenage Moods, Buildings, BNLX, Bloodnstuff, Strange Relations, Hollow Boys, Self-Evident, Blue Sky Blackout, Rabbit Holes, Deleter, Ex-Nuns, Mystery Train, Pony Trash, probably twenty others that the other FURYs could fill in. Even though Minneapolis/St Paul isn’t a huge metropolitan area, there is no shortage of excellent rock and roll, to say nothing of the healthy hip-hop and synth pop scenes. I’ve only lived here for a few years, but it’s definitely a musician’s town, and a very friendly one at that! MiG: What is it, do you think, that makes the Twin Cities a musician’s town? DB: Well, from my perspective, it’s very musician-friendly in the sense that there is a music scene here which is both cohesive and supportive. Bands go out to see other bands and buy each others’ records, there are lots and lots of clubs to play at, many open mic nights for musicians who are just starting out, lots of good record stores which don’t seem to be in danger of closing, a plethora of festivals all summer for bands to play at or fans to attend, and we are lucky enough to have not one, but two, very good radio stations in town (Radio K and The Current), who devote very popular chunks of their program schedule to new local music…it’s just a very supportive and pleasant set of cities in which to live and make sounds. MiG: With that atmosphere, what’s next for Fury Things? KW: I think I speak for all of us when I say that we want to keep having fun playing music. Our big picture plans, however, involve us getting a single released, working up to a full-length and touring again soon. We had a great time on the west coast this summer and the reception to us in Canada was much warmer than we could have hoped. So, while we continue to play out as much as possible here at home, our sights are set in the studio and on the road. We want to take it as far as we can.